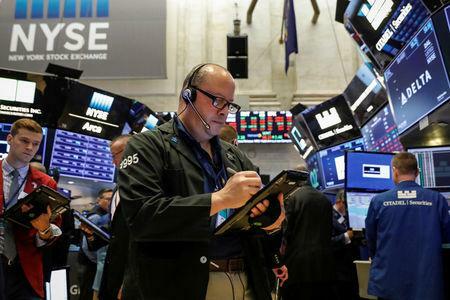 NEW YORK (Reuters) - Signs of movement in the U.S.-China trade stand-off and an interest rate hike in emerging market trouble-spot Turkey sent an index of global stocks higher on Thursday as risk appetite returned. Turkey's central bank also made a rare show of independence, ignoring a fresh bashing from President Tayyip Erdogan as it jacked up its interest rates by more than one-third, to 24 percent. MSCI's 47-country world index <.MIWD00000PUS> rose for a fourth straight day of gains, adding 0.58 percent. MSCI's broad emerging market stock index <.MSCIEF> leapt 1.36 percent. The Dow Jones Industrial Average <.DJI> rose 147.07 points, or 0.57 percent, to 26,145.99, the S&P 500 <.SPX> gained 15.26 points, or 0.53 percent, to 2,904.18, and the Nasdaq Composite <.IXIC> added 59.48 points, or 0.75 percent, to 8,013.71. U.S. consumer prices rose less than expected in August as increases in gasoline and rents were offset by declines in healthcare and apparel costs, and underlying inflation pressures also appeared to be slowing, data showed on Thursday. A slackening of inflation could slow the Federal Reserve's pace of rate hikes. The 2-year Treasury note, heavily influenced by Fed policy expectations, fell 1/32 in price to yield 2.7606 percent, from 2.748 percent late on Wednesday. The euro rose 0.57 percent to $1.169. The European Central Bank kept its rates deep in negative territory as expected, but it continues to move closer to normalizing policy. The day's big move in currency markets occurred in Turkey's lira. It fell 3 percent after Erdogan called for rate cuts, and then surged, rising 4.71 percent on the day when those calls were ignored. Inflation in Turkey is now almost 20 percent and the crisis there has spread to some other emerging market countries with sizable current account deficits. "If they hadn't hiked today then the real risk was that the lira would sell off sharply again and the country would swiftly head toward a balance of payments and even a banking crisis," said Aberdeen Standard Investments head of emerging market debt Brett Diment. Among commodities, oil prices fell on doubts about growth of demand for fuel, reversing some of the strong gains from the previous session. U.S. crude dropped 2.53 percent to settle at $68.59 per barrel.